Registering a Bongo abroad can prove to be expensive and time consuming. But member Mick Parsons managed to beat the bureaucrats in Spain. This is his tale. There have been many stories of Bongos abroad, and many owners who wish to export their vehicles to foreign lands. 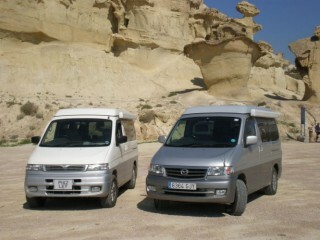 I had never heard of the Bongo until last summer when I met a fellow owner camping in Spain with his Bongo. As a result I was fascinated with the flexibility and versatility of these Vehicles, and had to get one! At the time I was between homes having sold my UK home, and I was living in a Motor Home in Spain, and waiting for my new home in Spain to be completed. Last August I returned to the UK and decided to part ex my 4 x 4 for a Bongo which I found in a dealership near Chichester. My Bongo is the new shape 1999 facelift Model and was already converted to the Standard layout side kitchen prior to purchase. I left the Motor home in the UK and travelled back to Spain in the Bongo fully loaded and had to fill the front seats and roof with luggage to bed down for the night. After 3 days I arrived back in Spain and took possession of my new home in Alhama De Murcia, Murcia, Spain. Due to the novelty of moving in and sorting out the new home etc I forgot to get the Bongo re-registered within the 30 day period so had to follow the long expensive route, and was then liable for import tax. In order to re-register the Bongo it had to pass the Spanish ITV (Similar to MOT) and to facilitate this I needed to move the rear fog light simple procedure which I did myself, and make the headlights shine the other way. There are no Headlights (that I am aware of) for the new shape Bongo which suit LHD so I hit a problem, luckily I utilised a local organisation that specialise in importing UK Cars and deal with ITV and local Garages. The Lady was brilliant and assisted me all the way through the process, and did all the talking and translating. First stop was a Car Electrical specialist who spent two hours on the Bongo and at the end managed to turn the Bulbs in order to meet the criteria and used the same headlight jig as the ITV centre, The Electrician gave me the thumbs up thumbs down gesture meaning it may or may not pass the ITV? Next we went to the ITV centre and had the lights checked before the ITV to ensure they would be OK and then the ITV. It was a nerve racking experience but eventually worthwhile, the ITV generates the Spanish Logbook which is more about weights and Measurements of wheel base spacing than anything else. Note for camper vans you need certificates for Gas and Electric and in Spain a certificate is required for any add on’s such as Awnings and Tow Bars. Luckily all was well (I was shown a loose exhaust bracket and advised to tighten it up afterwards) and I was issued with the appropriate documents and ITV sticker for two years. I believe this is “The First Bongo with Spanish Plates”. “El Bongo”. For the rear number plate I had to use one designed for the Alfa Romeo Front as standard Spanish plates would not fit? The whole process cost around 1400€ which included Electricians Bill, ITV, Number plates, Import Tax, and Agents fees. So if anyone else is looking at a similar venture you will need to work out if you want to go to the hassle and cost. At the end of the day I now have a legal Bongo on Spanish plates and can tour Spain from my base in Murcia. Since purchase I have added a few modifications and fitted a Fiamma Awning and gutted one of the cupboards to fit the Porta loo in. I also use a stand alone awning. For me as a Spanish Resident the Bongo gives me a neat compact touring vehicle to explore this corner of Europe. Apart from my friend I have seen two other Bongos in this area over the past year.